. According to Indian Christian traditions, the Apostle Thomas arrived in Kodungallur (presently in the Indian state of Kerala) in AD 52, established the Eight Churches and evangelised in present-day Kerala and Tamil Nadu. Many of these churches built near Jewish settlements. 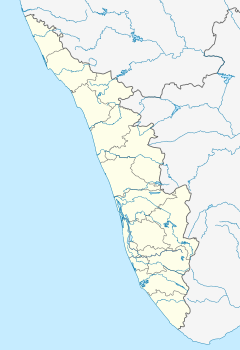 These were at Maliankara (Kodungallur), Kollam, Niranam, Nilackal (Chayal), Kokkamangalam, Kottakkayal (North Paravur or Kottakkavu), Palayoor and Thiruvithamcode (Kanyakumari). Of which Church at Maliankara is considered as first church. Church at Kanyakumari was buit on the land given by arachan (king) and hence the name Arappally. 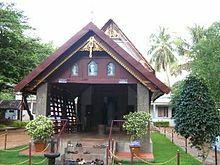 The Marthoma Pontifical shrine (Kodungaloor Mar Thoma Church) is considered to be the first church built by St. Thomas. The church is situated on the banks of the River Periyar about 6 km from Kodungallur, in the village of Azhikode in Kerala. St. Thomas Church, Palayoor is located at Palayur (also spelled Palayoor), in Thrissur district in Kerala on the west coast of India. According to tradition, it was established in 52 AD by St Thomas. It is one of the oldest churches in India, second only to Kottakkavu Mar Thoma Church, North Paravur and is called an Apostolic Church credited to the Apostolate of St. Thomas who preached and also started the conversion of people to Christianity here. Kottakkavu Church was established by St. Thomas in North Paravur in the Ernakulam district. It is considered to be the first Church in Kerala. The second church of Kottakkavu was rebuilt in the 9th century. The third church was built in 1308. Pope Gregory XIII raised the altar of this church to the status of privileged altar in 1575. Kokkamangalam Church is situated at Kokkamangalam near Cherthala in the Alappuzha district. St. Thomas sailed to Kokkamangalam where he preached the gospel for about a year. 1600 people converted to Christianity through him according to the narration in "Rampan Pattu", an ancient form of Christian folksong prevalent in Kerala. He formed a Christian community at Kokkamangalam and enshrined a cross for the faithful. Nilakkal is a forest, almost 52 kilometres east to Ranni and near Sabarimala in Pathanamthitta district. This church area was discovered during the time of Malankara Metropolitan Pulikottil Thirumeni (then head of the Orthodox Church). For the harmony of ecumenism among St Thomas Christians, then leadership of the Orthodox church paved the way to dedicate the church for all denominations. It was a mountain route of trade between Kerala and Tamil Nadu. Saint Thomas accompanied by Habban came over here and baptised 1100 people. Niranam Pally is one of the oldest churches in Kerala. It is believed that the church was founded by St. Thomas, in AD 54 at Niranam near Thiruvalla in Pathanamthitta district. The church was reconstructed several times since then. The stones in the church shows the reconstruction in 1259. On his way from Kollam in the northeast, he arrived at Niranam "Thrikpapaleswaram" by sea. He converted two Hindu Brahmin families named Pattamukkil and Thayyil and two Nair families named Manki and Madathilan to Christianity. He also gave priestly powers to the members of Pattamukkil family. Priests from the Pattamukkil family lived there and governed Niranam church and its properties in the ancient days. Tharavad is surrounded from three sides of Niranam Church. It is believed to be one of the oldest churches in Kerala and thus in India as well as among the oldest ones in the world. The architecture shows striking similarities to ancient temple architecture. It was established by St. Thomas. In ancient times, Kollam was a famous harbour and trade center. According to local tradition, St. Thomas established a church near the port, which is believed to have been destroyed by the Arabian Sea. ^ Hill, John (1963). "1-South India". The Rockliff New Project - Illustrated Geography - The Indian Sub-Continent. London: Barrie & Rocklife. p. 28. ^ Stephen Andrew Missick. "Mar Thoma: The Apostolic Foundation of the Assyrian Church and the Christians of St. Thomas in India" (PDF). Journal of Assyrian Academic studies. ^ Fahlbusch, Erwin (2008-02-14). The Encyclodedia of Christianity. Wm. B. Eerdmans Publishing. ISBN 9780802824172. ^ "History of Niranam Valiapally". niranamchurch.com. Retrieved 2016-03-05. ^ "The First Church in Tamil Nadu | Ara Palli, Thiruvithancode". Online Kanyakumari. Retrieved 2016-03-05. ^ "Marthoma Church at Azhikode, Marthoma Pontifical Shrine | Religious sites at Muziris Heritage Area, Ernakulam". www.muzirisheritage.org. Retrieved 2016-03-05.